Ajnara Panorama (Residential project by Ajnara Developer) is here with exciting home offers for buyers looking to invest in residential property in Delhi NCR. This is a golden opportunity for you and just the right time to get your dream home. 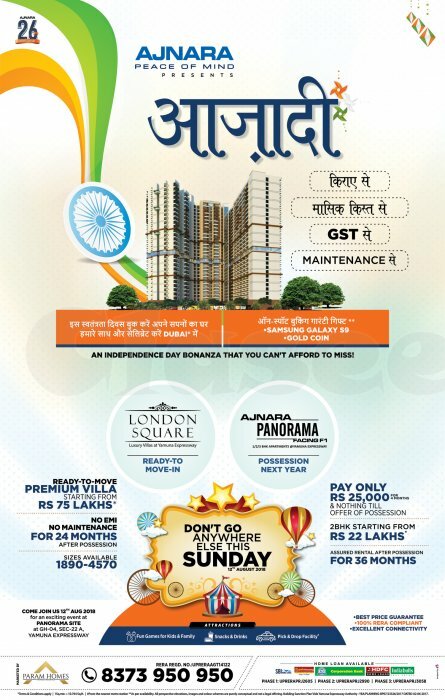 This Independence day Book your home at Yamuna Exp. & celebrate in Dubai by paying just Rs 25000* PM. 2 BHK starts from Rs 22 lacs with Assured rental for 36 months. Hurry!! Limited Period Offer.